Between personal life, the holidays, and other hobbies, work on my Shacket project has progressed at a rather stately pace. But I have made a new muslin that represents some real forward progress on the project. With Muslin B, I wanted to check and validate the fitting changes from the first shacket draft, this time with linings and interlinings in place so I can take into accout the volume they add to the finished garment. But this muslin was equally useful to practice lining insertion, and to help make style decisions. 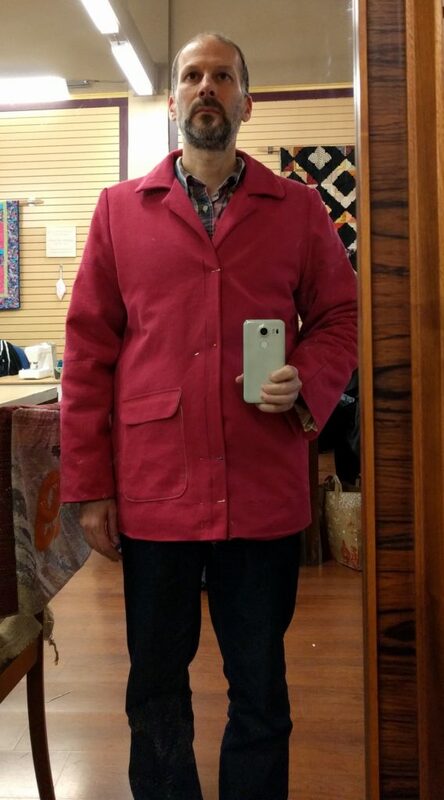 I am using fuschia bull denim for the outer fabric, black polyester fleece for interlining, and yellow polyester charmeuese for the lining as described in my previous article in the series. 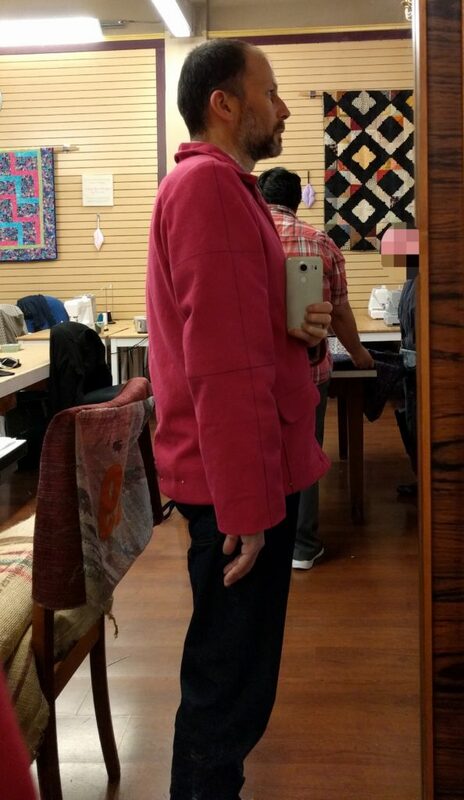 To me, the colors look garish, but others at the sewing studio commented the fuschia denim and yellow lining actually went together. Who knew! I bagged my very first lining with this muslin. I am following the method from Linda Lee’s Craftsy class, Underneath it All. Linda Lee demonstratees how to create pattern pieces for the lining, as well as how to bag and insert it. Her method is done mostly by machine. You machine-sew the lining to the front and back facings. Then you turn the sleeves inside-out, and machine-sew the lining to the sleeve hems. Then you turn it all back right-side out, and attach the lining to the bottom hem. The machine is used to close the bottom hem along front and sides, while hand-stitching seals up the bottom hem towards the back. The big decision I faced was what to do with the fleece interlining. I could attach it to the outer fashion fabric (which is technically called “underlining”, according to Linda Lee) or else I could attach it to the wrong side of the satin lining fabric. Both approaches have their pros and cons. 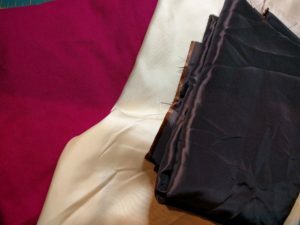 Attaching the interlining to the outer fabric is probably the most straightforward way to go, and it makes bagging the lining easier because the lining doesn’t have all that bulk. But since this is a shirt-jacket, I want it to have visible flat-fell seams on the outside along the side seams and armscye. Bulk from the fleece will get in the way there, even if I trim the fleece at the seam allowances. 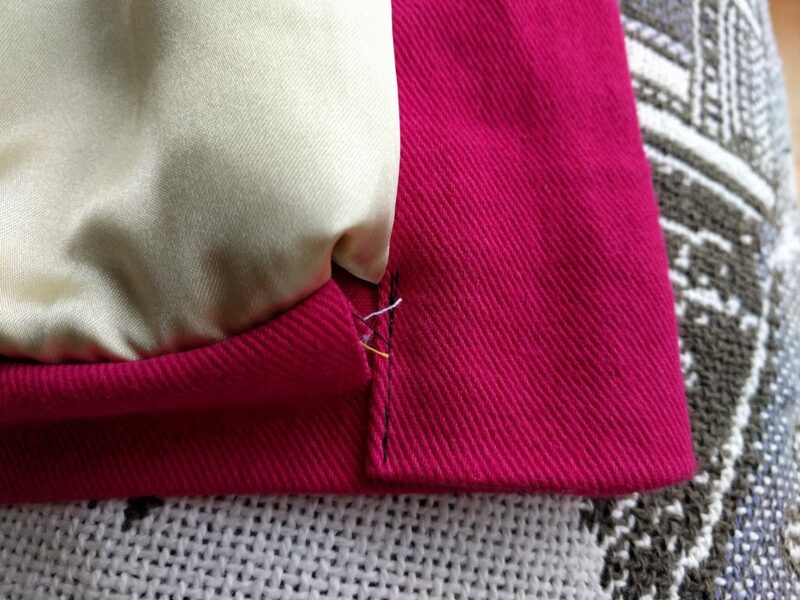 Attaching the fleece to the lining makes it easy to sew the outer fabric just like a shirt. But it adds bulk at the facing and hems, even if you trim the fleece at the seam allowances. It is also difficult to add a back pleat to the lining. Linda Lee adds a one-inch pleat to the lining piece, running down center back. It affords ease of movement in the finished garment. I chose to go with the fleece attached to the inside of the satin lining. But before I make the final shacket, I want to sew some samples to see if it is feasible to make flat-fell seams with fleece attached to the outer fabric as underlining. For instance, I might be able to get away with using mock flat-fell seams so the outside of the garment still looks shirt-like. Also, I came across an interesting technique from a Kenneth D. King book, Cool Tricks, to attach an interlining as underlining. You baste the interlining to a piece of “thin cheap” (to use KDK’s words) fabric, trim out the thin-cheap fabric on the inside of the piece, trim out the interlining from the seam allowance, and stitch the whole thing to your fashion fabric as an underlining. The thin-cheap fabric catches in the seam allowance and holds the real interlining fabric in place. More on this in future articles in the series. I hoped the pattern block still fit well with bulky fleece interlining sewed in, as in a finished garment. I’ll show the “before” photos of Muslin B first, followed by “after” photos with fitting and style changes pinned into the garment. Spoiler alert: I photographed the unaltered Muslin B last, so you can see the markings I made for the alterations if you look closely. Here are the “before” photos of Muslin B, as it looked hot off the sewing machine. Muslin B is a little too long at the hem, making it look more like a suit jacket than a shirt. Raising the bottom hem about 2 1/2 inches or so really makes the whole thing look more casual. I may want to add some some curves along the hem at the side seams, like you would find in a dress shirt. I haven’t worked that out yet. The shoulders and yoke fit well with the lining and interlining in place. As directed by the Linda Lee class, I added a back pleat to the lining. I left it basted shut, because the fleece interlining didn’t make any accommodation for it. It turned out the muslin provides enough backwards and forwards reach even without the pleat. So I will remove this pleat from the final shacket. The sleeve length, overall hang, and cap ease all turned out OK. But the sleeve is pretty wide, and it looks more like a tube than a sleeve. I pinned out some excess girth in the sleeve, starting with 2 inches at the cuff and tapering all the way up to the armscye. The resulting sleeve has some shape and style to it. The collar was a big wild card. 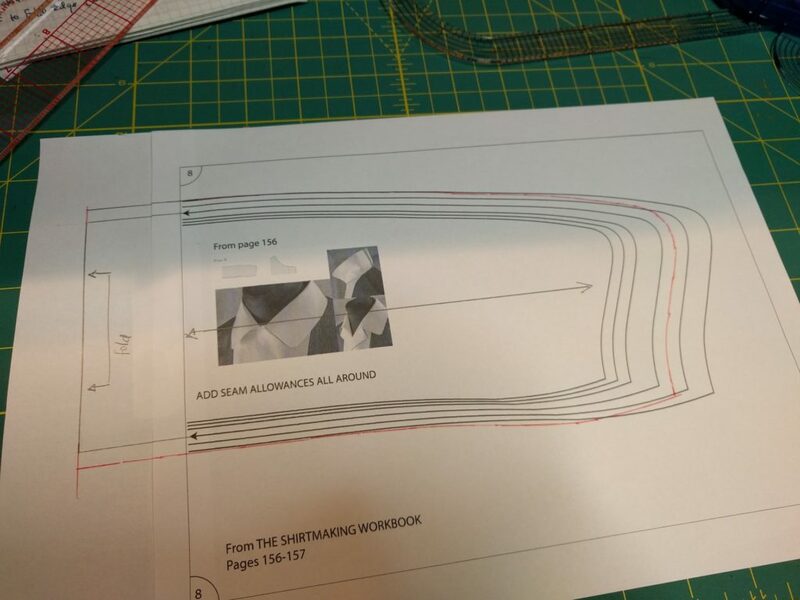 I needed a placeholder to start, so I grabbed one of the sample patterns from David Page Coffin’s book, The Shirtmaking Workbook. I selected the middle size from the multiple sizes given by the pattern, extended the circumference to match my own neckline, and added some seam allowance. I also followed the instructions from the book for constructing the collar, together with the front and back facing. The style critique I received at the studio was interesting. I was told the wide collar with the rounded points looked “very ’90s”. Myself, I thought the collar did look too large. I pinned out 3/4 of an inch all off the outer edge of the collar. I ended up with something that was at once more casual and more contemporary. With Muslin B, both front and back side seams taper from the armscye inwards by 1/4 inch at the natural waist (where you would locate the waist on a female form), then back out to the hem. The result is still overall boxy, but it does have some shape to it. 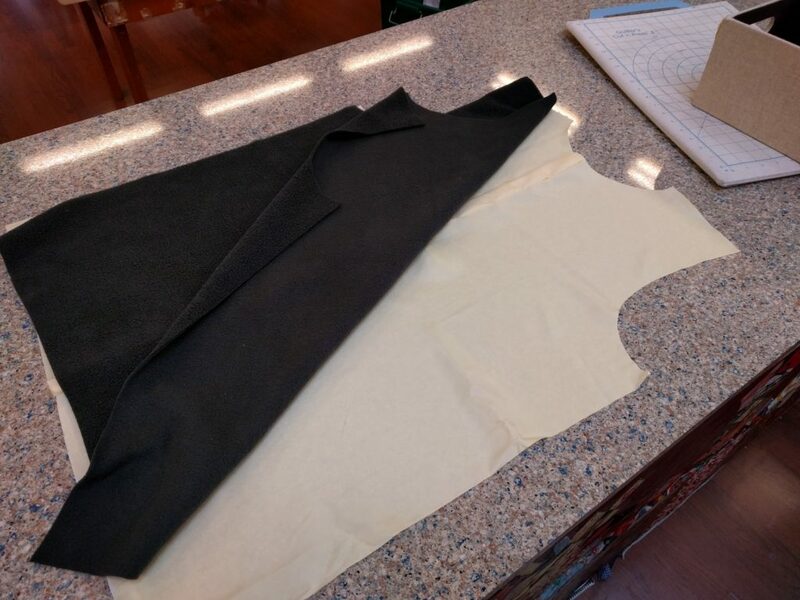 I added a front patch pocket to the muslin, loosely following the instructions from the Craftsy class Classic Tailoring: The Blazer by Steffani Lincecum. I didn’t bother with the “cheating” she does to make sure the pocket lining favors inward and does not show on the outside of the garment. (I also got the fashion fabric inside out, but all’s fair in a muslin). I placed the pocket where my hand naturally sits, but it ended up too close to the newly raised bottom hem. It also looks lopsided; the top of the pocket is tilted weirdly even though I aligned the edge of the pocket with center front. It’s easy to fix the lopsidedness, but I’d rather have two patch pockets over the chest area, and some other pocket treatment towards the waist and hem. I intentionally made the front lining piece a little bit wider than the space it needs to occupy, again to provide some ease. But it seems a bit too wide; when I align side seams of the lining and outer shell and stitch towards center front, a big bubble forms where the lining meets the facing. This is what muslins are for. I need to understand and troubleshoot this flaw (either in pattern or in construction) before moving ahead to the final garment. I’m not addressing cuffs in this muslin, though I can’t avoid the issue for much longer. Here is Muslin B, with the style alterations temporarily pinned into place. This muslin used up all the fleece I had intended to use for the final garment. My first thought was buy more cheap black fleece from JoAnn’s, but I stopped by Fabric Outlet to see what they had on hand. I discovered this really great water-resistant outerwear fabric. 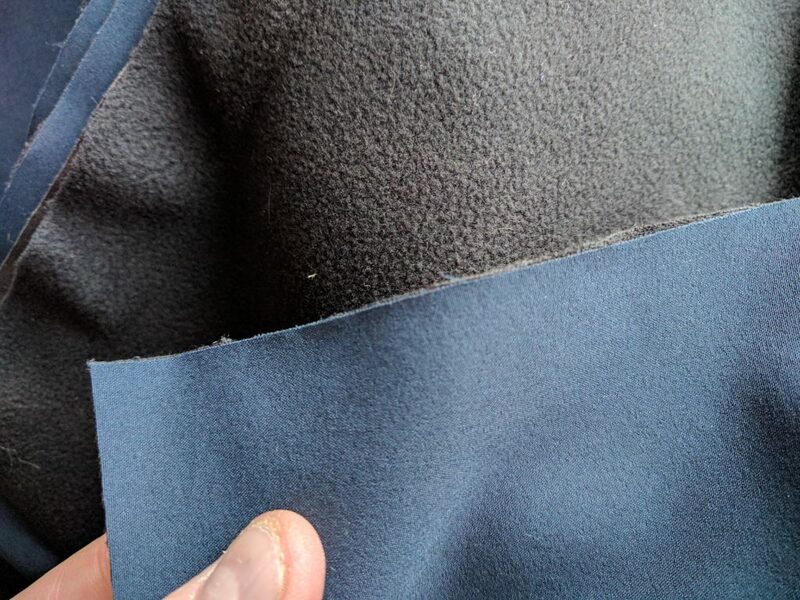 One side (navy in the photo) is a water-resistant nylon, the other side is fleece. 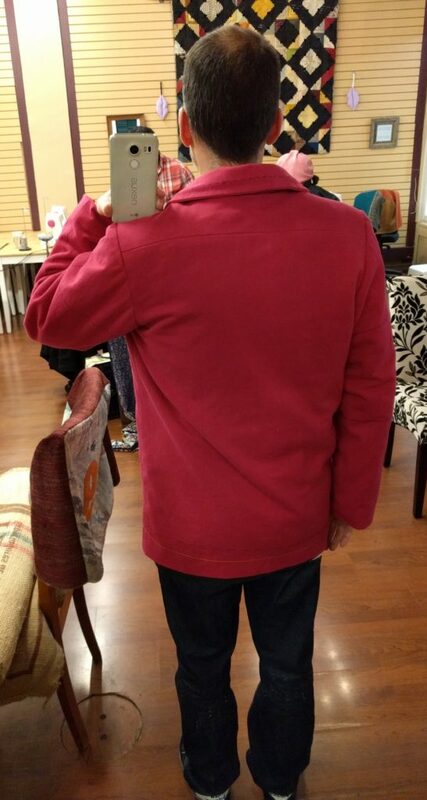 It’s thinner and less bulky than JoAnn’s fleece. I bought enough for the project plus an extra half-yard for experimentation. At first, I thought to use it as interlining just like I did on my muslin. But realizing the nylon is slick enough to use it as the lining, I realized I could skip the polyester satin. 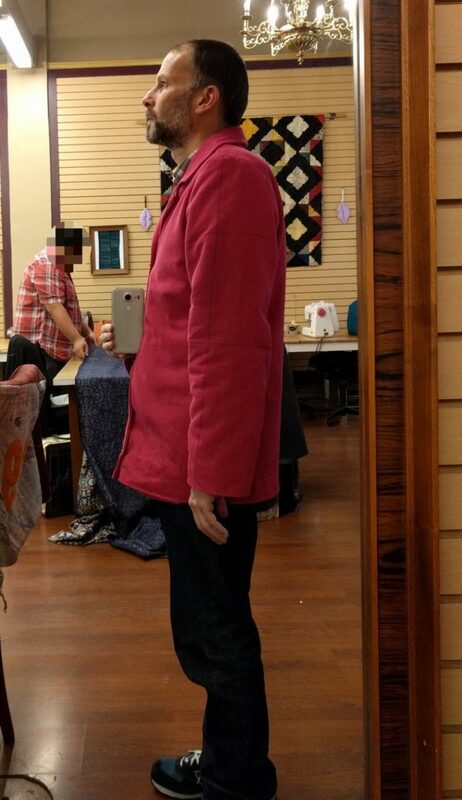 But then the helpful person cutting my fabric at the counter suggested I make a reversible jacket! Mind blown. A reversible shacket makes a lot of sense, because with the nylon layer facing the body, it won’t really be water-resistant. Reversing the nylon layer would allow it to face the elements and provide protection on rainy days. I can’t promise that’s where I’m going with the project, but I’m giving it serious thought and consideration. If you know any sources (online and otherwise) for designing and constructing reversible garments, please let me know in the comments. Thanks! Unbeknownst to me, the Saks Fifth Avenue alterations department was housed in a building just a few blocks from my home. It has closed down, and the building will be torn down to build more condos (nobody at Saks is losing their jobs, I am told). While on a walk, I spotted the open doors and invited myself in, not quite knowing what I would find. 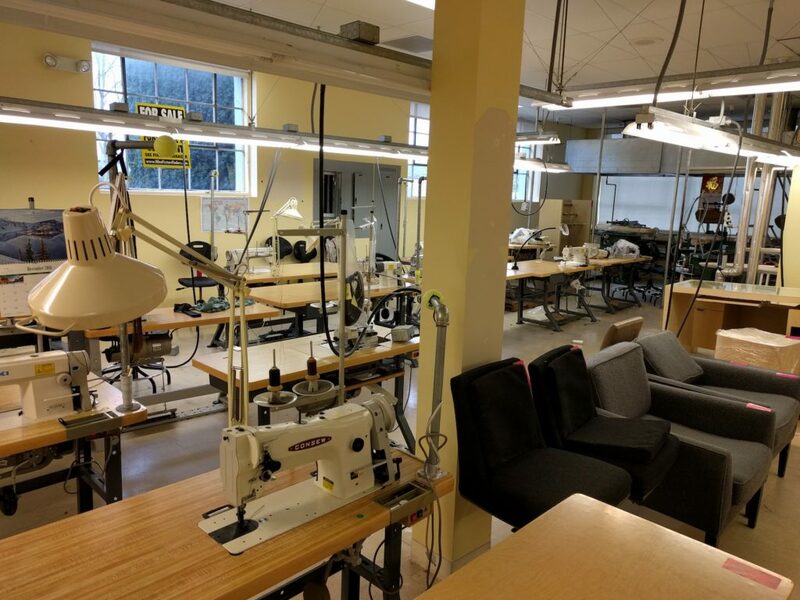 I stumbled into a fully-equipped professional workroom, containing industrial sewing machines and sergers, pressing equipment, worktables, chairs, you name it. All of it for sale at liquidation prices. And several professional dress forms. I don’t know much about pro-quality dress forms at all, so I wasn’t sure what size to get. 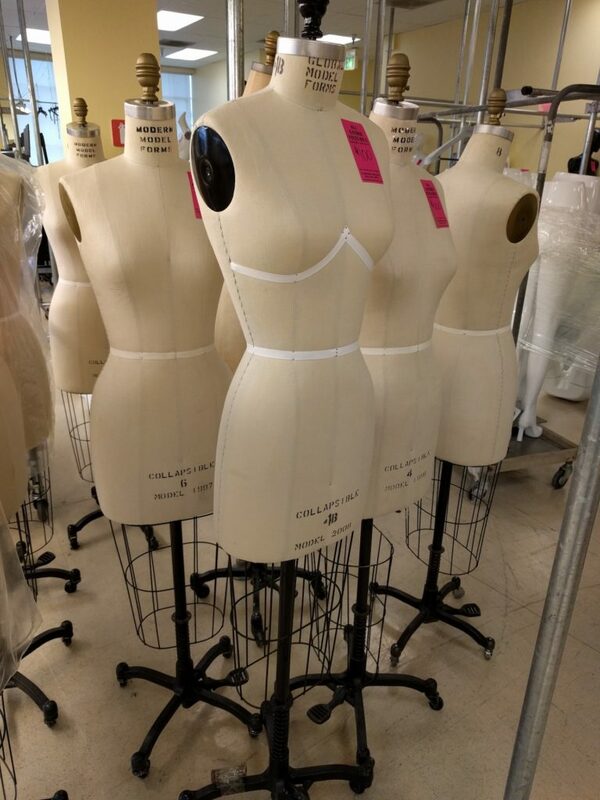 After consulting with the liquidation sales person and checking online, I decided to go with a size 8, which should be a fairly versatile size for practicing draping. Cost: $100. I am planning to take a course in Fashion Draping at Community College of San Francisco for the spring semester, and this dress form will be wicked awesome for doing the homework assignments. I also found a cutting table, with leaves that drop down and fold for storage. 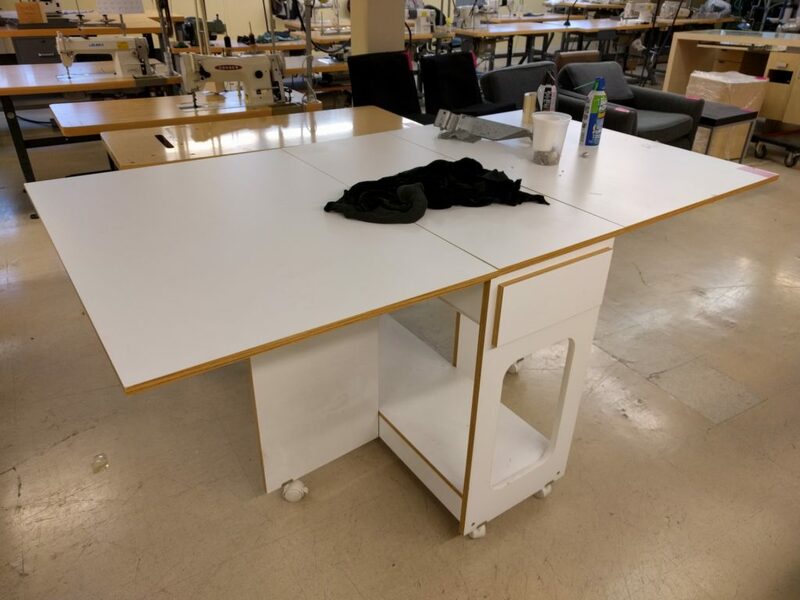 I’ve been using a computer desk as a cutting surface, but it’s not suitable for large projects. I’ll really enjoy having this cutting table at home. It should also provide some shelf space to hold my sewing machines. This entry was posted in Fabrics, Outerwear, Pattern Fitting, Project Planning, Shirts and tagged blue-plaid-shacket, shacket on January 9, 2017 by mportuesisf. Side view of muslin shows hem to curve up to center front, lower pocket not vertical. For hem, you might need to lengthen center front and curve to side seam, reset, then check that side view of hem is parallel to floor. Pocket placement should be dependent on top line of pocket being perpendicular to center front, not side of pocket being parallel to center front. Another way to underline is to use cotton flannel and quilt it to the lining. I bag linings factory style by constructing lining with sleeves set in, sew to front and back facing, then sleeve hems. Sew back hem, then turn at opening at sleeve seam, and close opening later when everything is finished. Close with machine, leaving a visible seam closing (won’t be seen when inside the sleeve she’ll), or close with hand sewn ladder stitch for a couture finish. Yes, I did notice the hemline is a little tilted towards back. The pattern draft does have a lengthened center front that curves to side seam, BUT that went out the window when the hem was pinned up. 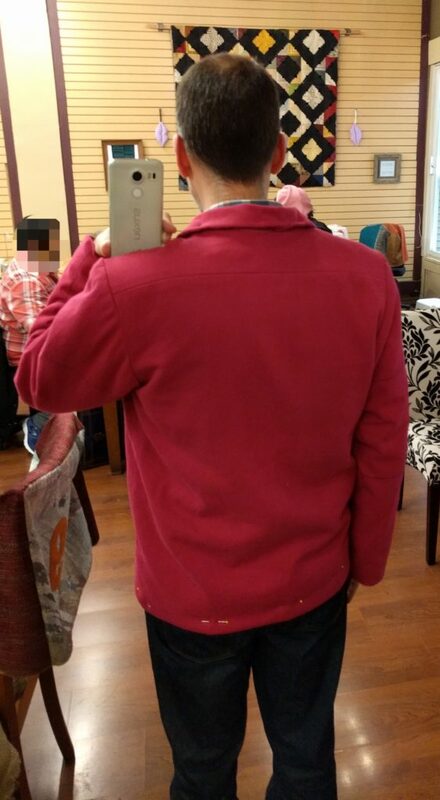 Yes, I did learn that lesson when I looked at the pocket in the mirror! But I’m not sure I want patch pockets there. 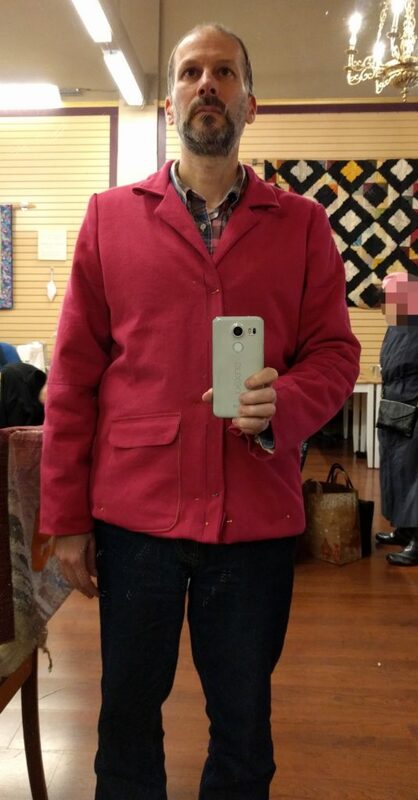 I was concerned cotton flannel may not be warm enough, which is why I chose fleece. But fleece could be quilted to the lining also. I’m pretty sure Janet Pray covers the factory-style method of installing a lining in one of her Craftsy classes, the one where she makes a motorcycle-style jacket. I chose the Linda Lee method for this muslin just as a way to get my feet wet with installing linings. And partly because the way Janet Pray structures her video classes, you have to jump all over the place to get the full demonstration for a particular technique. I agree with you about either eliminating or rethinking the lower pockets. They swing the pendulum more towards “jacket”, whereas chest pockets read more as “shirt”. But that’s just me. I would also add that center back pleat back into your plans. The pleat could be in just your lining material, not in the fleece behind it. I’ve come to learn that there’s more fabric strain back there than we imagine. Plus you will kick yourself forever if the sleeve or side seams start to rip out. Been there, done that! Think of it as a little insurance policy. 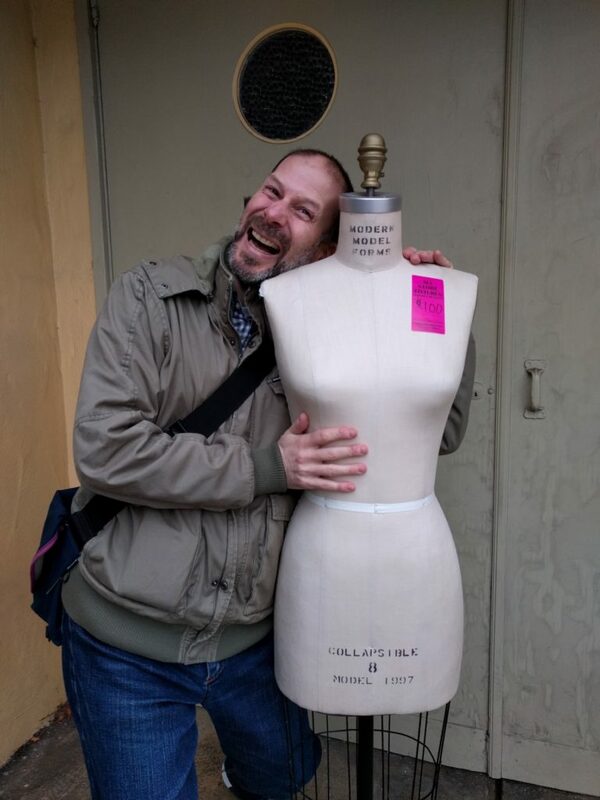 So ya FINALLY found the right gal – and a store bought woman at that! The cutting table is envy inducing (not that I have a jealous bone in my body). If it’s not too soon, or politically charged to murmur: KDK in 2020! Even though the dressform was a great deal, I really appreciate the cutting table more. The extra table space makes every aspect of project work easier. Anyone know where we can get some “KDK 2020” bumper stickers printed up?